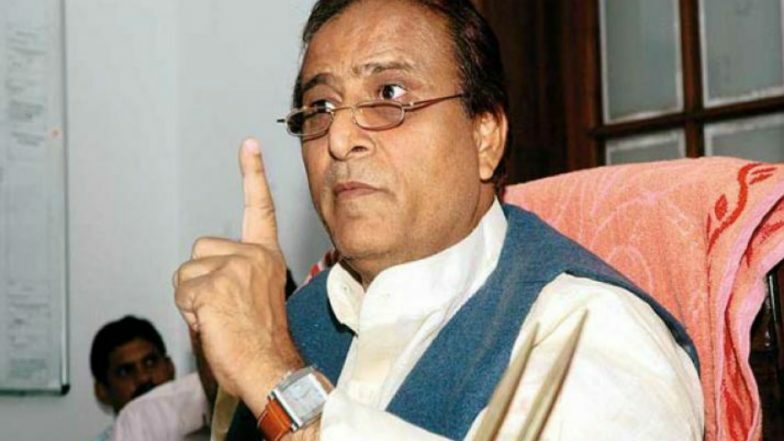 New Delhi, April 14: In what further lowers the political discourse in the ongoing Lok Sabha elections 2019, Samajwadi Party (SP) veteran Azam Khan took a derogatory jibe at former party member-turned-BJP leader Jaya Prada. Khan's remarks were aimed at levelling the "communal" tag on the actor-politician. Khan and Prada are contesting against each other from the Rampur parliamentary constituency. The seat was represented by the yesteryear actor for 10 years on SP ticket, before being dethroned by BJP's Nepal Singh in 2014. Rampur Lok Sabha Constituency in Uttar Pradesh: Candidates, Current MP, Polling Date and Election Results 2019. "I brought her (Jaya Prada) to Rampur. You are a witness that I did not allow anyone to touch her body. It took you 17 years to identify her real face but I got to know in 17 days that she wears khaki underwear," said Khan while addressing an election rally here. Ahead of the upcoming elections, Prada joined the BJP and was announced the party candidate from Rampur, whereas, Nepal Singh was denied the ticket by the saffron camp. Meanwhile, the Akhilesh Yadav-led SP decided to field Khan, the incumbent legislator from Rampur assembly seat, to take on Prada. Khan, who was a founder-member of Mulayam Singh Yadav's party, was suspended from the Samajwadi Party in 2009 after he campaigned against Jaya Prada in the then Lok Sabha polls. The suspension incident was recalled by him at the same rally where he delivered the below-the-belt jibe. "Remember for two people I was expelled from the SP. I did not rebel. I did not complain and I waited. I did not change the boat," he said, adding that he is a true samajwadi where his "rival candidate", Prada, is ideologically linked to "khaki" aa reference to the BJP's ideological parent RSS.